Assistant City Manager Jon Skidmore explains the role of city staff in the planning of OSU-Cascades. 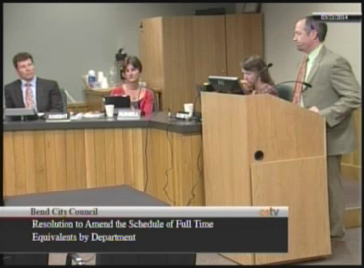 The City of Bend is slowly, but surely, rebuilding its staff following the recession of 2008. Last night’s City Council meeting provided a considerable boost to those efforts with the unanimous approval of nearly 21 additional full-time staff positions, a 4 percent increase. Among the departments getting a boost are law enforcement, street operations, the sewer extra strength program, and planning. In discussion of the allocation of the new positions, some councilors raised concerns about whether these jobs would support the needs presented by the new Oregon State University Cascades campus. Assistant City Manager Jon Skidmore said that a variety of city staff are working with the university, but that it’s premature to hire a specific OSU-Cascades liaison. City Manager Eric King said that such a position might be on the table come November, but that the current focus is primarily transportation. Council also approved a fee structure to support the reclassification and appeal process for businesses in the sewer extra strength program. Businesses looking to contest their classification will need pony up $118 in reclassification fees and $250 in monitoring feeds (to cover the testing to support reclassification). If the request is denied and the business wants to appeal, it will cost $150 to submit. The fee structure came out of a request from business owners on the sewer extra strength committee to create opportunities for reclassification and the financial resources to support city staff in processing those reclassifications. -Council approved an agreement between the City of Bend and Cascade Divide COLO, Inc. to extend a Bend Enterprise Zone Property Tax Exemption for five consecutive years for capital investment purposes. – Councilor Sally Russell said some city residents rate increasingly concerned about the safer and transparency of oil and other potentially dangerous products traveling through Bend via train and noted that Sen. Ron Wyden will be in town for a public roundtable Friday to discuss oil train safety.